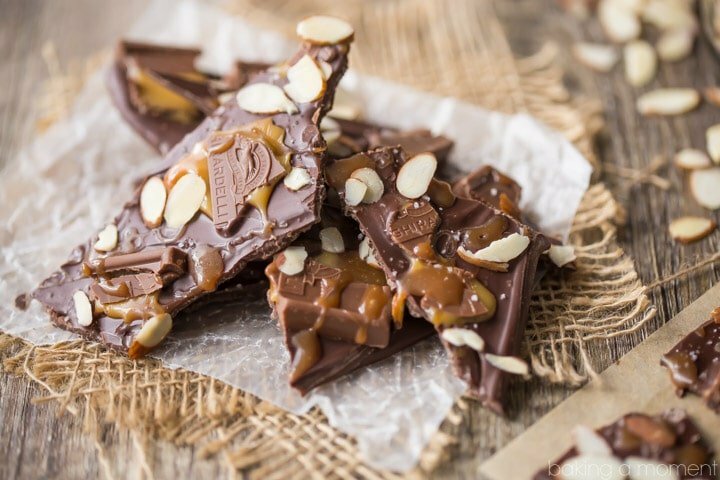 Learn the basics of making the easiest and most fun kind of homemade candy: chocolate bark! 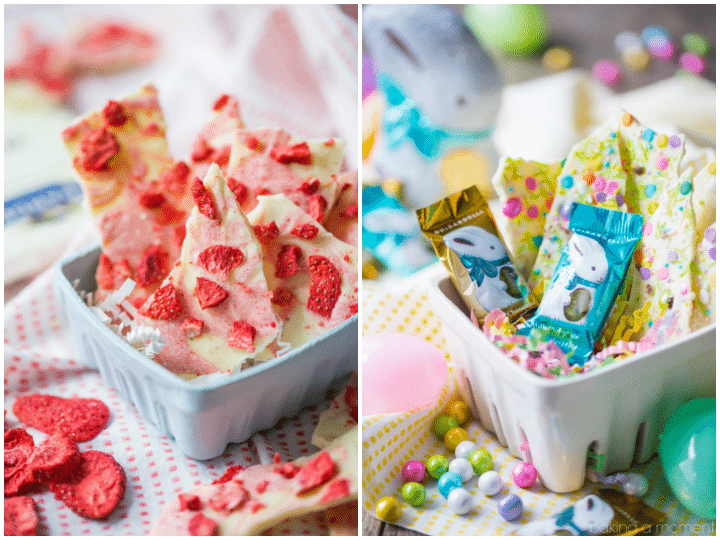 With three unique variations and some great ideas for Easter! 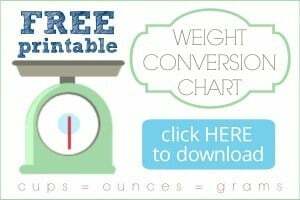 This is a sponsored post, written by me and created in partnership with Ghirardelli Chocolate Company. All opinions expressed herein are straight from my heart. Have you ever thought about making homemade candy? I know the idea might sound a little intimidating, but I’m here to tell you that it can be completely effortless and so much fun! I’m talking about chocolate bark. It doesn’t get much simpler, and you can have SO much fun playing around with different flavor combinations. Here you see a chocolate version with caramel, almonds, and sea salt, but I’ve also made a strawberries and cream variety, and a sweet and seasonal white chocolate funfetti take that’s just perfect for Easter! 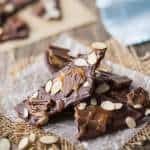 Chocolate bark is basically just melted chocolate, spread out in a thin layer and topped with whatever your heart desires. Once the chocolate cools and hardens, you can break the sheet into more manageable pieces. It’s really easy and you can let your imagination go crazy with all the different combinations of toppings. I place my chopped Ghirardelli Baking Bars in a shallow metal bowl, and sit that bowl over a small pot of very warm water. The water should be between 110 and 115 degrees F, or about the temperature of a very warm baby’s bath. Just let it sit like that, stirring with a silicone spatula every 5 minutes or so, and changing out the water if it gets too cool. In about 15 minutes you’ll have beautifully melted chocolate that will cool and harden perfectly shiny and gorgeous. 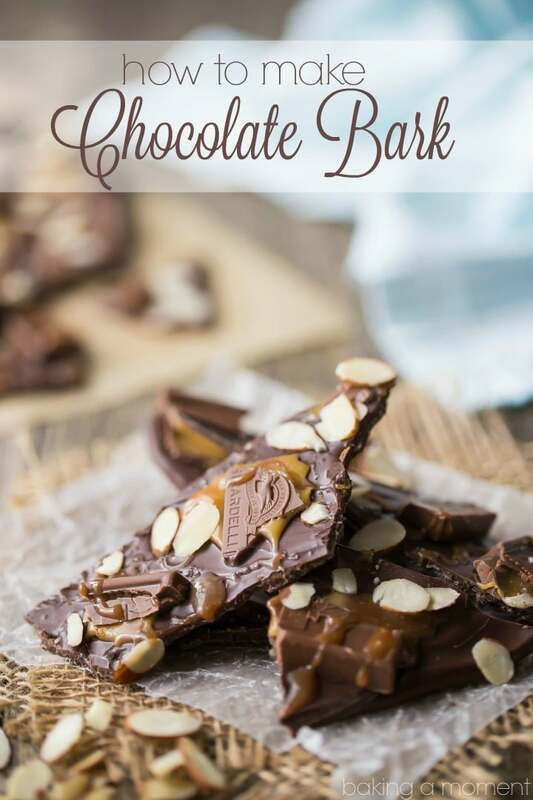 When I make chocolate bark, I pick up Ghirardelli because I know it will turn out perfectly. In fact, it’s my favorite brand to use! When it’s made with Ghirardelli, you’re in for a rich and delicious chocolate experience every time. 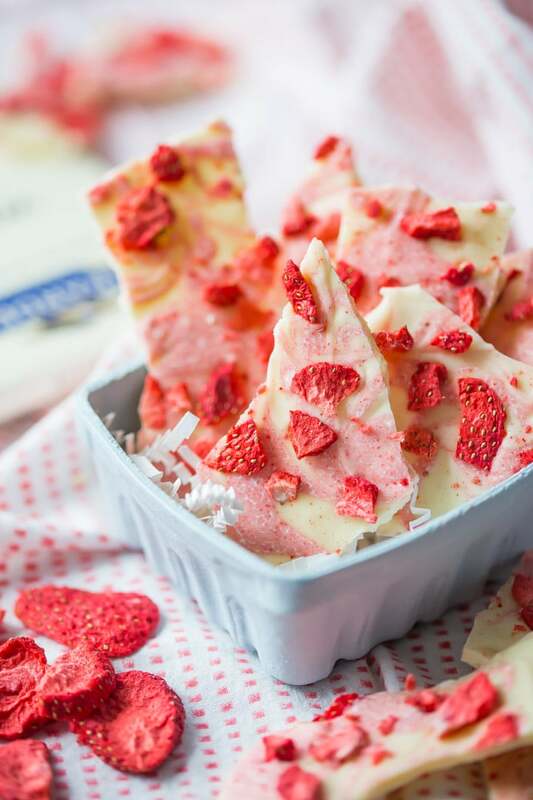 For the strawberries and cream bark, use freeze-dried strawberries if you can get your hands on them! I find mine at Trader Joe’s, but they can also be sourced easily online. They’re great because they pack an intense strawberry flavor punch, have a light, crisp texture, and a really vibrant color. You can even grind them into a fine powder and use that to color and flavor some of the white chocolate. It’s a great way to get that gorgeous pink swirl without using any artificial dyes. And they’re so dry you don’t have to worry about them causing the chocolate to seize or separate. 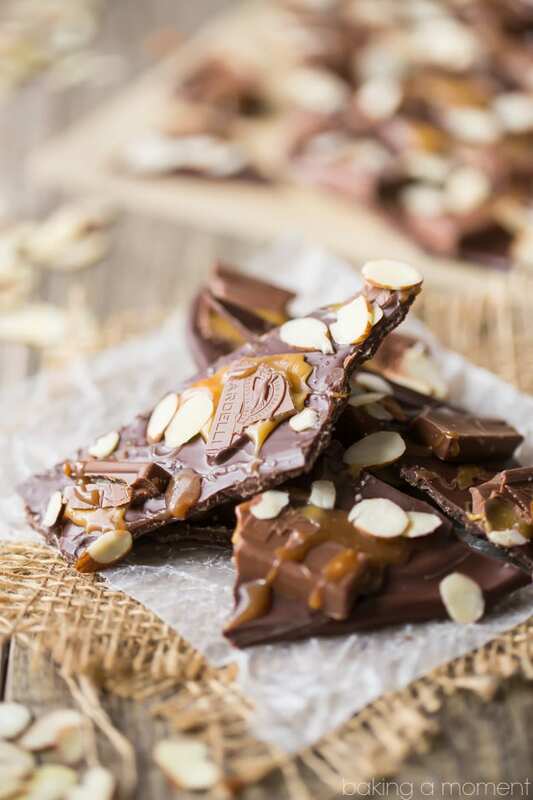 The chocolate almond caramel bark was my family’s favorite, and we made it by topping semi-sweet chocolate with flaked almonds, fleur de sel, and Ghirardelli Milk Chocolate & Caramel Squares that are just broken up and scattered around. I love the way the gooey caramel swirls and flows all throughout the bark. If you’re finding it too sticky or messy, try freezing the squares first and then chopping them roughly. Lastly, we have the Easter funfetti bark. How cute is this for the Spring holidays? It would work really well for Passover too. 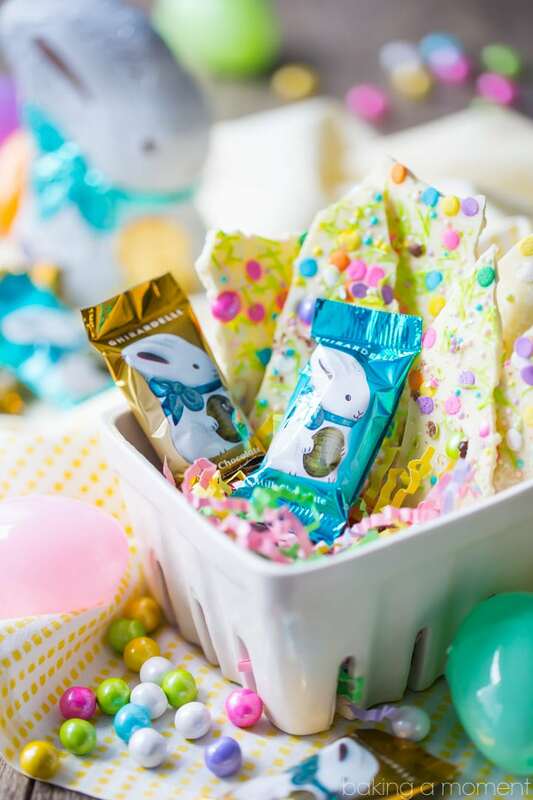 Using the Ghirardelli’s Classic White Baking Bar, just scatter pastel-colored edible sequins, nonpareils, edible Easter grass, and any other fun springtime sprinkles you can find. There are tons at the craft stores right now! 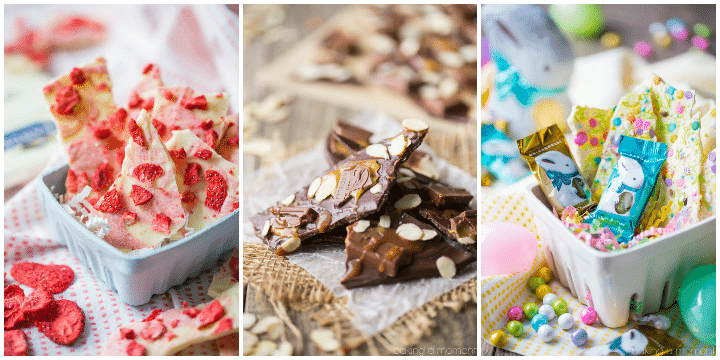 Any of these chocolate bark ideas will work really well for your Easter gift-giving. 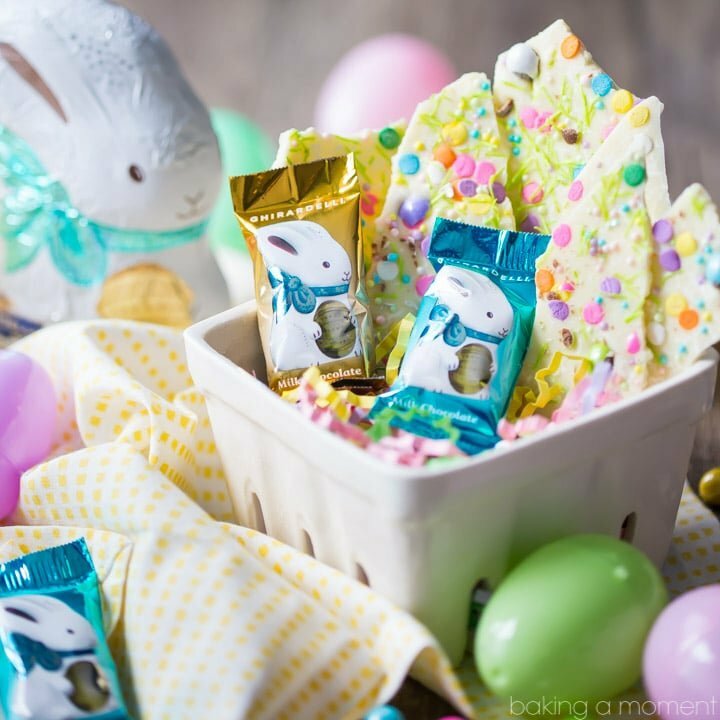 Just tuck a few pieces in a basket, along with Ghirardelli’s Chocolate Bunnies and other Easter favorites! … and get more great Easter ideas at Ghirardelli.com/Easter. More great candy recipes on my “Candy Recipes” Pinterest board! Place the chopped chocolate in a shallow metal bowl. When all the chocolate is melted and smooth, pour it onto a parchment-lined baking sheet, and smooth it out into a thin, even layer. I love how deceptively simple making bark is!!! All of these look delicious! I completely agree Kayle! Thank you so much! Oh my! So many possibilities! Bark is one of my favorite sweet snacks! I love all of the different options! So easy, and so many ways to make it perfect for the holiday! Delicious and easy…gotta love it! Easy treats like this are the best! This is SO perfect for Easter! So perfect for an Easter basket!